New missions have been added for the Wings of the Goddess expansion. Introduction of "Fields of Valor." 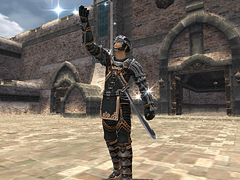 "Fields of Valor" is a new system in which players can take on voluntary training regimes to slay a number of specified enemies in an assigned period of time. One training regime may be undertaken per Vana'dielian day. If successful, players will receive experience points, gil, and Fields of Valor points redeemable for other benefits. *Monsters must yield experience in order to constitute confirmed kills. Players can undertake training regimes by examining the "Field Manual" in any of the areas listed below, then selecting "Individual Training" and choosing their desired objective from the subsequent menu. There are two varieties of Treasure Caskets, locked and unlocked. Unlocked caskets will contain temporary items that can only be used in the area in which they were acquired, while locked caskets will contain non-temporary items and equipment. Players can now warp to Aht Urhgan Whitegate from Jeuno by talking to the Salaheem's Sentinels representative deployed there. *In order to use this service, you must be a mercenary of Salaheem's Sentinels and have completed the quest offered by the NPC in question. The respawn time for Treasure Coffers and Treasure Chests has been shortened, and the chances of obtaining artifacts, maps, and key items from them have been increased. 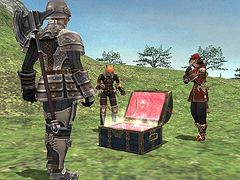 Furthermore, after obtaining items or gil from a coffer or chest, players will temporarily become unable to receive items or gil from other coffers or chests. Furthermore, with the above changes, certain doors that prior to this version update had been constantly open will now remain closed until activated. New Campaign Ops have been added. NPCs have been added which will distribute temporary items to players when participating in a Campaign battle in an area under the control of the Beastman Confederate. - Upon the depletion of their stock, NPCs will temporarily return to headquarters in order to replenish their stores. - NPCs will take defensive action against aggressors, but during that time will be unable to dispense items. Should they become incapacitated in the course of battle, a replacement will be dispatched after a certain amount of time has elapsed. - Item availability and quantity is directly influenced by each nation's skill and production levels. In Campaign battles, the strategic resource capacity of a stronghold will now decrease depending on the presence of destructive entities such as besieging enemy Siege Turrets. At the time of a Campaign tally, should influence over an area change hands from the Beastman Confederate to the Allied Forces of Altana, or vice versa, the stronghold fortifications and resources will now be replenished to half. However, no such replenishment will take place in the case of headquarters trading hands. The time delay before starting up Besieged after completion of server maintenance has been increased. Members of a Level Sync party will no longer lose beneficial status effects such as Protect should the synchronization designee level up. Accumulated TP, and the effect of the Charm ability on monsters, will also no longer be lost. While under the effect of Level Sync or any other form of level restriction, attack delays for crossbows can no longer be faster than 216. The Reraise effect granted by certain spells and items will no longer be removed by magic and abilities such as Dispel and Voidsong. While the query selection boxes associated with the white magic spell Raise and the black magic spell Tractor are being displayed, the same spells will no longer be able to be cast on that player. When the experience points gained by a dragoon result in their wyvern receiving a status boost, the wyvern's HP will now be fully restored. The following Group 2 merit point abilities have been added for the dancer and scholar jobs. The fee for recharging these items will be consistent regardless of whether payment is required in Conquest points, Allied Notes, or Imperial Standing points. Many new pieces of equipment have been added. 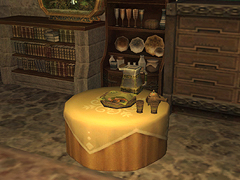 Several new pieces of furniture have been added. Several new synthesis recipes have been added. Chocobo Whistles will now be usable during Level Sync given that the player meets the level requirement after synchronization has taken effect. The artifact and relic armor sets for the dancer and scholar jobs can now be enhanced by the NPC Sagheera, found in Port Jeuno. 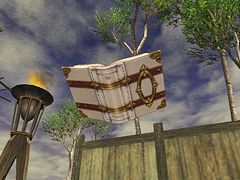 Dancer and scholar-specific items have been added to the treasures obtainable in the Dynamis and Limbus areas. The fees incurred for storing all item sets and furnishings have been halved. The amount of fishing fatigue incurred has been increased for characters below level 20, and for characters for whom less than two weeks have elapsed since their first login. In addition, the quest-related items, "Ripped Cap," and "Fat Greedie," will be easier to catch for players meeting certain conditions. 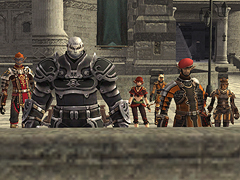 Macros to target party members (<stpt>), and alliance members (<stal>), have been added. With these macros, it is possible to target any party or alliance member, including those not currently on screen. When used, a target icon will appear in the window displaying that party member's status. The icon will not appear when the macro is used to target characters on screen. The potency of the dragoon's wyvern ability Healing Breath will now be adjusted accordingly when level restriction has taken effect. In Fields of Valor, canceling a training regime by way of a job change will result in players having to wait one Vana'dielian day before being able to undertake another. *This issue can be bypassed by canceling your current training regime through the Field Manual. Players who attempt to trade with another who is already doing so will be shown an unnatural system message. The rare item icon is not displayed for the Hero's Combat battlefield entry item, "Cordial Invite." *Only one of these items can be in the possession of a player at any given time. When talking to a map marker NPC, the marked locations for outpost warp NPCs do not reflect their new positions. In the help text for the scholar's new Group 2 merit point ability "Enlightenment," the reduction in recast time is incorrectly displayed as 1 minute 30 seconds. The correct figure is 1 minute 15 seconds. The introduction of the new "Moblin Maze Mongers" system originally scheduled for this version update has been delayed due to extension of the QA period. The specific release schedule will be announced on Topics as soon as it is decided.